government entities or insurance companies. Revenue Cycle systems are traditionally built to interact with other systems—think computers talking to other computers—not the consumer of the healthcare services. 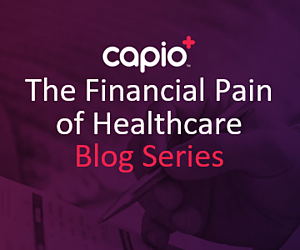 Due to that and other factors, almost 70% of healthcare providers claim it takes more than a month to collect from individual payers, which increases staff time and, ultimately, costs to collect. This is clearly not a sustainable solution—for either patients seeking healthcare or for the providers whose mission it is to provide that care. Industries change and evolve, and there are winners and losers when those shifts happen. (Don’t believe us? Talk to someone who worked as a travel agent in the 1980s.) In this scenario, the winners will be healthcare providers who recognize the transformation that is happening and learn to embrace the new powerhouse in the payer market: patients. To evolve, we must first understand the change that’s happening and the ramifications it’s having on all players. Then we can discuss possible solutions and the results we can expect to see once this new paradigm is embraced and adopted. To that end, we present a four-part series focused on each of those areas. For our first post, we’ll detail what the shift to higher out-of-pocket healthcare expenses means for patients. Part two focuses on how providers are affected. Lastly in Part three we will layout possible solutions and the positive outcomes providers can expect.